The autonomous vacuum cleaners or automated floor cleaning robots have been on the market for over a decade now, it is only in recent years that they have started become widespread across the globe. Innovation and technological advancements in robotics have allowed the manufacturers to add more smart abilities and convenience features, and this has been the major factor in driving the growth of highly efficient and fully automated floor cleaning robots market. Autonomous floor cleaning robots are majorly used in residential spaces to clean floors and pools. Today’s automated floor cleaning robots consist mobile base, highly efficient batteries and AI technology to clean even hard to reach surfaces with longer operational period and room mapping abilities. Autonomous floor cleaning robots still constitute a minute market share of the global vacuum cleaner market, but their recognition and adoption is growing at a significant pace. Today’s busy lifestyle and no or less time for home cleaning and other responsibilities has led to the increased demand for automated floor cleaning robots that offers fully automatic functionalities. This is anticipated to augment the demand for Self Driving Floor Cleaning Robots around the world, especially in developing countries. The Vacuum Cleaner Market accounted for USD 7.0 billion in 2016, of which automated floor cleaning robots accounted for 21.0% market share. Goldstein Research analyst forecast the global autonomous floor cleaning robots market to expand at a CAGR of 15.1% during the forecast period 2016-2024. Further, the market is anticipated to reach USD 4.2 billion by the end of forecast period. The report covers the present ground scenario and the future growth prospects of the Self Driving Floor Cleaning Robots Market for 2016-2024 along with the total revenue of automated floor cleaning robots in every region. We calculated the market size and revenue share on the basis of revenue generated per segment, regional, and country level. The revenue forecast is given on the basis of number of automated floor cleaning robot manufacturers and current growth rate of the market. Based on end users, residential customers accounted for the largest revenue share of more than 65% in global autonomous floor cleaning robots market in 2016. Demand for autonomous floor cleaning robots from commercial consumers tends to be the fastest growing which is likely to expand at a CAGR of 17.0% over the forecast period i.e.2016-2024. Global Autonomous Floor Cleaning Robots Market Outlook 2016-2024, has been prepared based on an in-depth market analysis from industry experts. The report covers the competitive landscape and current position of major players in the global autonomous floor cleaning robots market. The report also includes porter’s five force model, SWOT analysis, company profiling, business strategies of market players and their business models. Global autonomous floor cleaning robots market report also recognizes value chain analysis to understand the cost differentiation to provide competitive advantage to the existing and new entry players. Our global autonomous floor cleaning robots market report comprises of the following companies as the key players in the global autonomous floor cleaning robots market: iRobot Corporation, ECOVACS ROBOTICS, Neato Robotics, Dyson Ltd., Samsung Electronics Co. Ltd., Maytronics Ltd., Metapo, Inc, Koninklijke Philips N.V., LG Electronics Inc., Panasonic Corporation, Miele & Cie. KG, Hayward Industries, Inc., Haier Electronics Group Co Ltd, Sharp Corporation, ILIFE Robotics Technology, Vorwerk & Co. KG, Electrolux and Taurus Group. 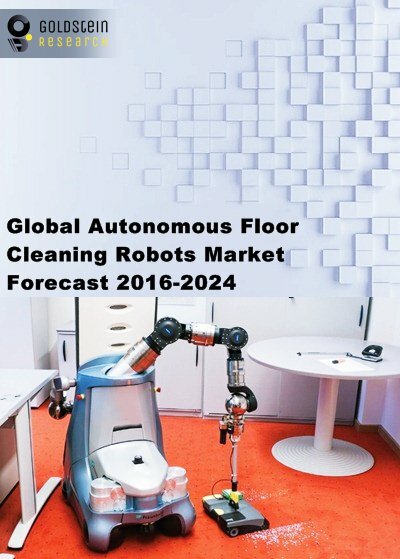 According to our global autonomous floor cleaning robots market study, on the basis of extensive primary and secondary research one major trend in the market is internet connected autonomous cleaning robots in smart homes and office spaces. Smart concept include autonomous cleaning robots being able to enter the rooms without human assistance by means of automatic doors, smarter door locks or by connecting these robots to speech assistants such as Apple's Siri and Amazon Alexa. According to the report, major driver in global autonomous floor cleaning robots market is technological advancement of automated floor cleaning robots. In past few years, global autonomous vacuum cleaners has witnessed the launch of advanced models fitted with advanced sensors and lasers to enable these machines to follow a logical cleaning path. Where the Autonomous Vacuum Cleaners Market is expected to reach USD 3.8 million by 2025, growing at a CAGR of 15.1% during 2017-2025. Additionally, growing female employment in developing countries along with rising disposable income are also the major factors driving the growth of autonomous floor cleaning robots market. Further, the report states that one challenge in global autonomous floor cleaning robots market is high price of advanced autonomous floor cleaning robots. Averagely, most advanced automated vacuum cleaners are priced around USD 500 and above, and the high price of the product is the major factor hindering the mass adoption of autonomous vacuum cleaners. Geographically, Asia Pacific region accounted for the largest market share with 41% revenue share in global autonomous floor cleaning robots market. Asia Pacific region is also the fastest growing region and is likely to expand at a CAGR of 20.0% over the forecast period i.e. 2016-2024. China, Japan and Singapore are the most lucrative countries in the region owing to consumer awareness about robotic vacuum cleaners are relatively high compared to other APAC countries. 7.2.5. Samsung Electronics Co. Ltd.